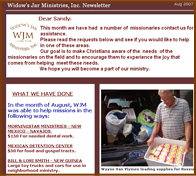 Once a month WJM sends out an e-newsletter, which shows what services we have performed in the last month, and what the current needs of various missionaries are. Read the current month here. If you would like to receive this e-newsletter, please enter your email address in the space provided. Widow's Jar will not use or sell email addresses to any outside commercial solicitation, marketing, or promotions.